Parsley, Sage, Rosemary and Thyme is the third studio album by American music duo Simon & Garfunkel. Produced by Bob Johnston, the album was released on October 24, 1966 in the United States by Columbia Records. Following the success of their debut single "The Sound of Silence", Simon & Garfunkel regrouped after a time apart while Columbia issued their second album, a rushed collection titled Sounds of Silence. For their third album, the duo spent almost three months in the studio, for the first time extending a perfectionist nature both in terms of instrumentation and production. The album largely consists of acoustic pieces that were mostly written during Paul Simon's period in England the previous year, including some recycled numbers from his debut solo record, The Paul Simon Songbook. The album includes the Garfunkel-led piece "For Emily, Whenever I May Find Her", as well as "7 O'Clock News/Silent Night", a combination of news reports of the day (the Vietnam War, the civil rights movement, the death of comedian Lenny Bruce), and the Christmas carol "Silent Night". Many critics have considered it a breakthrough in recording for the duo, and one of their best efforts. "Homeward Bound" had already been a top five hit in numerous countries and "Scarborough Fair/Canticle" performed similarly. The album peaked at number four on the Billboard Pop Album Chart and was eventually certified triple platinum by the Recording Industry Association of America. 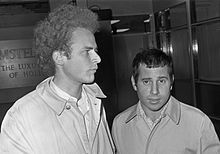 Simon & Garfunkel were given four months to record the album, which allowed the duo considerable freedom in terms of creativity. The band's previous album, Sounds of Silence, was a "rush job" produced to capitalize on the success of their first hit single, "The Sound of Silence". The studio time for Parsley caused its budget to increase into an unusual cost for albums at that time—around $30,000 (US$231,662 in 2018 dollars), Simon speculated. Parsley was the first time Simon insisted on total control in aspects of recording. The album was the duo's first to be recorded on an eight-track recorder, which the duo persuaded Columbia Records to use. Vocal takes were overdubbed, as they found it difficult to get "decent separation" between Simon's voice and guitar. Columbia executives took notice of the longer production time, commenting, "Boy, you really take a lot of time to make records." The bulk of Parsley was recorded over a week in June 1966, with an additional recording date in July and two in August. Two previously released songs from the December 1965 Sounds of Silence sessions were also added to the track listing: "Homeward Bound" had originally been released as the second single from that album but had been left off the track listing of the US LP release; and "Flowers Never Bend with the Rainfall" had already appeared on the B-side of "I Am a Rock". Garfunkel considered the recording of "Scarborough Fair" to be the moment the duo stepped into the role of producer because they were constantly beside Roy Halee mixing the track. 16-second sample from Simon and Garfunkel's "Parsley, Sage, Rosemary and Thyme". Parsley, Sage, Rosemary and Thyme is largely characterized by sharp contrasts from song to song. Simon found it difficult to write new songs; biographer Peter Ames Carlin notes that the sequence of promotion, including concerts and interviews, made Simon feel out of his element. "He needed things to be familiar", he wrote. In addition, sudden fame had affected both his relationships and him personally. Much of the album is composed of recycled songs written by Simon during his period in England in 1965. Three songs on the album—"Patterns", "Flowers Never Bend with the Rainfall", and "A Simple Desultory Phillippic"—also appear on Simon's first solo effort, The Paul Simon Songbook ("Canticle", the second half of opening ballad "Scarborough Fair", is also culled from another song on the record, "The Side of a Hill"). "Scarborough Fair", a traditional ballad, combines "fingerpicked guitar accompaniment, delicate chimes, harpsichord embellishments, and the vocal blend". "Patterns" posits that the average life is no more predetermined than that of a rat in a maze. String snaps are used prominently in "Patterns", as well as a "syncopated bass and frenetic bongo part". Much of the original guitar line remains the same from its earlier incarnation. "Cloudy" revolves around "a hitchhiker's meanderings in northern California". It employs a "breezy, almost jazzy musical style". "Homeward Bound" carries a sense of melancholia, which biographer Marc Eliot attributed to an "echo of longing" that had resurfaced during the recording process over the failed relationship with Kathy Chitty. "The Big Bright Green Pleasure Machine" is a "satirical appropriation of an electric, organ-heavy psychedelic rock style," in which the singer complains of various woes in his life, which can be "readily eased" by purchasing the titular device. "The 59th Street Bridge Song (Feelin' Groovy)" is a brief vignette "made up of variations on a two-bar ostinato figure," in which the protagonist goes about a carefree morning. "The Dangling Conversation" concerns a dying relationship, but Garfunkel disliked the song, feeling it pretentious. In contrast to its earlier appearance on The Paul Simon Songbook, "Flowers Never Bend with the Rainfall" appears here as a "folk combo that produces a bright, almost bluegrass sound". "A Simple Desultory Philippic" is a "satirical rant about the singer's confrontations with a wide variety of pop-culture personalities and phenomena". In the song, Simon vocally imitates Bob Dylan, as well as his harmonica interjections. "For Emily, Whenever I May Find Her" has sometimes been thought to be named after poet Emily Dickinson. Simon later explained that "For Emily" is not about an imaginary girl Emily, but about a belief, while the song "Overs" (from the album Bookends) is about the loss of that belief. While other songs, such as "The Sound of Silence", had taken months for Simon to complete writing, others, such as "For Emily", were written in a single night. "A Poem on the Underground Wall" largely revolves around a man creating graffiti on a sign in a subway station, with Simon also bringing into play "a variety of visceral and religious images". "7 O'Clock News/Silent Night" is a sound collage consisting of the duo singing "Silent Night" in two-part harmony over an arpeggiated piano part while a news report plays. "The result rather bluntly makes an ironic commentary on various social ills by juxtaposing them with tenderly expressed Christmas sentiments." The simulated newscast was voiced by Charlie O'Donnell, then a radio disc jockey. Shot by photographer Bob Cato, the cover depicts Simon & Garfunkel in a flower garden. "Artie is sprawled in jeans and a royal blue sweater, while Paul rises just behind, the modern poet-troubadour clad in cambric and shadow," wrote Peter Ames Carlin in Simon's biography, Homeward Bound. The original back cover of the LP includes an essay by music critic Ralph J. Gleason. There were some copyright disputes about the album's contents. "Cloudy" was co-written by Bruce Woodley, who did not initially receive credit upon the album's release. He still collected royalty payments for the song, but was not listed as an official writer as Simon "needed" it to be credited to him alone. Martin Carthy, who had first introduced Simon to "Scarborough Fair" during his time in England, was never credited. Worse, according to Peter Ames Carlin, "it credited Paul and Artie as coauthors, as if the centuries-old tune had emerged entirely from their imaginations." Columbia was contacted by Carthy's publishing company, Sparta Florida, to claim royalties, and they complied. However, as Carlin notes, "none of the money ever got to Carthy" due to fine-print on a contract he had never read that ceded his stake in the song. After issuing several singles and receiving sold-out college campus shows, Parsley, Sage, Rosemary and Thyme was released by Columbia Records on October 24, 1966. The duo resumed their trek on the college circuit eleven days following the release, crafting an image that was described as "alienated", "weird", and "poetic". Manager Mort Lewis also was largely responsible for this public perception, as he withheld them from television appearances (unless they were allowed to play an uninterrupted set or choose the setlist). Bruce Eder of AllMusic called it the duo's "first masterpiece", one that regarded "youthful exuberance and alienation, [proving] perennially popular among older, more thoughtful high-school students and legions of college audiences across generations." Andy Fyfe of BBC Music wrote in 2009 that he felt the record carried a sense of timelessness, calling its "boldest themes [...] still worryingly pertinent today," while remarking that the record as a whole "reflected the social upheaval of the mid-60s while playing as substantial a part in folk rock's evolution." In 2003, Rolling Stone listed the album at number 202 on their list of The 500 Greatest Albums of All Time. Disc jockey and author Pete Fornatale wrote that "Few others have come close to the intelligence, beauty, variety, creativity, and craftsmanship that Parsley, Sage, Rosemary and Thyme captured." Andrew Gilbert, in 1001 Albums You Must Hear Before You Die, called it "their first great album," producing "a sense of impending doom and Simon's insistence on emotional connection that makes the album such an enduring work." All tracks written by Paul Simon except where noted. Art Garfunkel – vocals, piano on "7 O'Clock News/Silent Night"
Carol Kaye – bass guitar on "Scarborough Fair/Canticle" and "Homeward Bound"
John Meszar – harpsichord on "Scarborough Fair/Canticle"
Eugene Wright – double bass on "The 59th Street Bridge Song"
Joe Morello – drums on "The 59th Street Bridge Song"
Charlie O'Donnell – spoken vocals on "7 O'Clock News/Silent Night"
^ a b Carlin 2016, p. 136. ^ a b c d Dimery, Robert (ed.) (2005). 1001 Albums You Must Hear Before You Die. Milan: Universe Publishing, p. 94. First edition, 2005. ^ a b Jon Landau (July 20, 1972). "Paul Simon: The Rolling Stone Interview". Rolling Stone (113). Retrieved May 27, 2016. ^ Bennighof 2007, p. 31. ^ Carlin 2016, p. 135. ^ a b c Eliot 2010, p. 71. ^ a b Bennighof 2007, p. 22. ^ a b Bennighof 2007, p. 23. ^ Carlin 2016, p. 109. ^ a b Carlin 2016, p. 142. ^ Bennighof 2007, p. 24. ^ Bennighof 2007, p. 26. ^ Bennighof 2007, p. 27. ^ Bennighof 2007, p. 28. ^ a b Bennighof 2007, p. 29. ^ a b Bennighof 2007, p. 30. ^ "Three for Tonight". Kraft Music Hall. January 3, 1968. NBC. ^ Jackson, Laura (2004). Paul Simon: The Definitive Biography. New York: Citadel Press, p.99. First edition, 2004. ^ a b Bennighof 2007, p. 32. ^ Carlin 2016, p. 138. ^ Carlin 2016, p. 143. ^ Eliot 2010, p. 73. ^ a b Eliot 2010, p. 72. ^ Bruce Eder. "Parsley, Sage, Rosemary and Thyme – Simon & Garfunkel". AllMusic. Retrieved May 7, 2014. ^ Andy Fyfe (2009). "BBC – Music – Review of Simon & Garfunkel's Parsley, Sage, Rosemary and Thyme". BBC Music. Retrieved May 7, 2014. ^ "Australiancharts.com – Simon & Garfunkel – Parsley, Sage, Rosemary and Thyme". Hung Medien. Retrieved May 7, 2014. ^ "Official Albums Chart Top 100". Official Charts Company. Retrieved May 7, 2014. 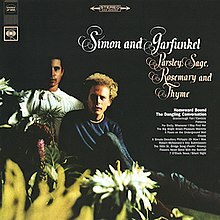 ^ "American album certifications – Simon & Garfunkel – Parsley, Sage, Rosemary and Thyme". Recording Industry Association of America. If necessary, click Advanced, then click Format, then select Album, then click SEARCH. Carlin, Peter Ames (2016). Homeward Bound: The Life of Paul Simon. Henry Holt and Co. ISBN 978-1-627-79034-5.